Buy and sell used Balers / Hay Equipment at IronPlanet. from any and all manufacturers, including Case IH, John Deere, Massey Ferguson, New Holland and more. From Hay Rake and Misc. Balers/Hay Equipment to Mower Conditioner and Round Baler, you can be sure to find exactly what you need. If you are looking for used Balers / Hay Equipment, be sure to check out our upcoming equipment auction. 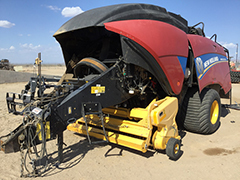 View agriculture seeding and tillage equipment for sale at Ritchie Bros.